With a taste similar to thyme, although more powerful with notes of celery and pepper, Ajwain is an exciting and unusual spice. Native to southern India, Ajwain is most commonly added to chutneys, curried dishes, breads and legumes. 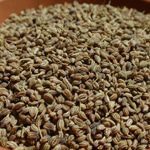 It's related to cumin and parsley, and is also known as carom and bishop’s weed.